No, not the flower, silly. Although they are gorgeous. 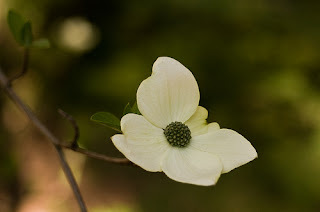 Today I'm celebrating my friend Dogwood. It's because of her that I started knitting several years ago-- I'd never considered it until she told me how relaxing it is and showed me the cute scarves she made. I hoped Dogwood would teach me to knit, but she moved to another city around that time and we couldn't seem to get together, and I couldn't wait to learn. I ended up going to a knitting store in my neighborhood for my first lesson, and the woman who taught me was cold and gruff and didn't have any of Dogwood's enthusiasm. I went home and cried because it made me realize how much I missed my friend and how meaningful it would have been to have learned how to knit from someone special to me. Because knitting is so much more than a craft-- it is transformative and healing, a prayer and a means of expressing love. Knitting teaches you the joy of slowing down and sitting quietly. It teaches you to accept and maybe even celebrate imperfection, and it teaches you that your hands have the ability to create without always needing direction from your head. Anyway, back to Dogwood. One of the many reasons I'm celebrating her today is because she donates most of her knit and sewn items to charities that help those in need, like premature babies, children who feel all alone, cancer patients, and young mothers struggling to overcome addiction. 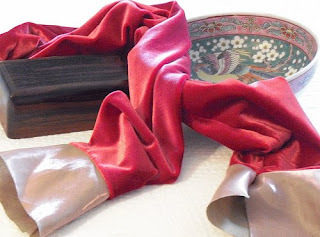 Here are a few of Dogwood's scarves-- these are velvet with silk trim. 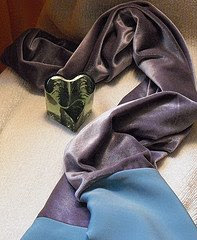 I believe she sews the velvet in a tube and then adds the silk. They look so soft and cozy. 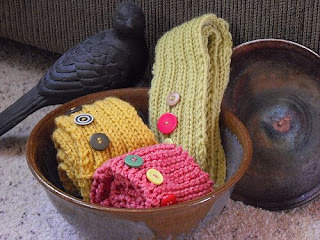 Here are some of her ribbed scarves-- I love the decorative buttons. The bowl is from T-Pots Pottery. When I was going through a difficult time, Dogwood made me this quilt. She kept telling me she was making me something, and I kept trying to guess what it might be, but really had no idea. We met for lunch one day and she gave it to me-- I was so surprised and happy. No one had ever made me a quilt before, and I was sorely in need of a security blanket. By now Dogwood is probably blushing furiously, and maybe even a little annoyed with me for gushing over her so much. She makes these cute little angel pins, donates them to charities and gives them to people on the street who look like they could use an angel. PS. Dogwood isn't her real name, it's her nickname because she loves the flower. What a nice sentiment for a good friend like that. Happy Birthday Dogwood! Dogwood sounds like an awesome friend. Those are the very best kind! How sweet! Her work is beautiful, too.